It has been almost three weeks since I’ve seen Sushi my adorable Shih Tzu. Somehow or other, I did not have the chance to go back to Kota Kemuning, so my puppy and I have not had the chance to meet. I miss seeing him wait for me at the front door when I come home from work. I miss his excited bark asking my mother to open the door quickly. I miss his turbo-wagging tail as he waits for me to put down my stuff and give him attention. He will then come charging towards me and jump on my lap as I give him a complete body rub. I say “Where’s your toy?” and he takes off at the speed of puppy and retrieves his favourite toy back to me, and we spend some time playing together until I get bored. Sushi’s probably quite lonely nowadays. During thunderstorms he gets so scared that he comes to hide under my legs. Now he has no one, and has to hide under the dining table or crawl into the space between the sofas. I feel sad that I can’t be there for him. My mom tells me that he continues to wait for me every evening. It breaks my heart picturing him being disappointed day after day. she scared her papa will pilih kasih eh? 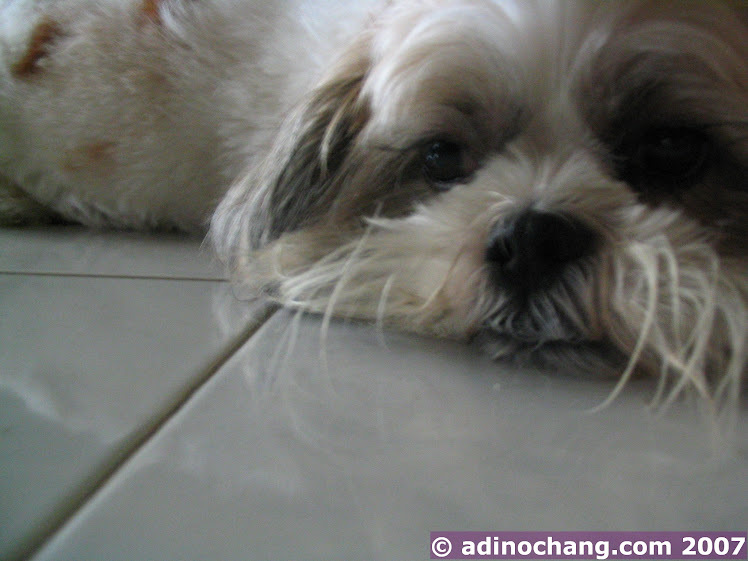 Adino: Don’t know… my wife said maybe baby don’t like the doggy smell. Hi… totally understand how u feel….I love my dog to bits. At least sushi has ur parents and a wonderful home 2 stay in 🙂 And you still get 2 see her quite often….